The Bank Routing Number, sometime referred as ABA Number, is a 9 digit number assigned by the American Bankers Association (ABA) to uniquely identify the bank on which payment is drawn. The bank routing number is also referred as check routing number because it generally appears at the bottom of your check leaflet. 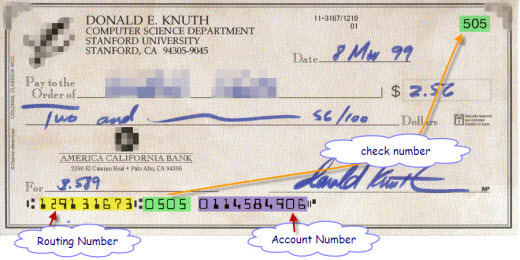 Routing Number on checks is actually a Routing Transit Number (RTN), a 9 digit code which was designed to facilitate the sorting, bundling, and shipment of paper checks back to the drawer’s (check writer’s) account. The RTN is also used by Federal Reserve Banks to process Fedwire funds transfers, and by the Automated Clearing House to process direct deposits, bill payments, and other such automated transfers. Routing numbers may differ depending on where your account was opened and the type of transaction made. You can use the search box provided below to find the routing number for your bank. Author adminPosted on November 17, 2011 December 1, 2011 Categories Routing NumbersTags ABA Number Full Form, Meaning of ABA Number, Routing Number Meaning, What is ABA Number2 Comments on What are Routing Numbers? First Community Bank is one of the banks in USA. You can search for offices and branches of First Community Bank using our branch locator tool. You can find First Community Bank office/ branch locations and address, phone number and other contact information in a particular City, ZIP Code, County or State. Just Enter the City or Zip or County or State in the below or simply click on the city of yours below that. Flagstar Bank (FSB) is one of the banks in USA. You can search for offices and branches of Flagstar Bank using our branch locator tool. You can find Flagstar Bank office/ branch locations and address, phone number and other contact information in a particular City, ZIP Code, County or State. Washington Federal is one of the largest banks in USA. You can search for offices and branches of Washington Federal using our branch locator tool. You can find Washington Federal office/ branch locations and address, phone number and other contact information in a particular City, ZIP Code, County or State. Northwest Savings Bank is one of the largest banks in USA. You can search for offices and branches of Northwest Savings Bank using our branch locator tool. You can find Northwest Savings bank office/ branch locations and address, phone number and other contact information in a particular City, ZIP Code, County or State. Webster Bank is one of the largest banks in USA. You can search for offices and branches of Webster bank using our branch locator tool. You can find Webster bank office/ branch locations and address, phone number and other contact information in a particular City, ZIP Code, County or State. Sterling Savings Bank is one of the largest banks in USA. You can search for offices and branches of Sterling Savings bank using our branch locator tool. You can find Sterling Savings bank office/ branch locations and address, phone number and other contact information in a particular City, ZIP Code, County or State. Guaranty Bank is one of the largest banks in USA. You can search for offices and branches of Guaranty bank using our branch locator tool. You can find Guaranty bank office/ branch locations and address, phone number and other contact information in a particular City, ZIP Code, County or State. Trustmark National Bank is one of the largest banks in USA. You can search for offices and branches of Trustmark National Bank using our branch locator tool. You can find Trustmark National Bank office/ branch locations and address, phone number and other contact information in a particular City, ZIP Code, County or State. Community Bank, National Association is one of the largest banks in USA. You can search for offices and branches of Community Bank, NA using our branch locator tool. You can find Community Bank, NA office/ branch locations and address, phone number and other contact information in a particular City, ZIP Code, County or State. First Tennessee Bank, National Association is one of the largest banks in USA. You can search for offices and branches of First Tennessee Bank, NA using our branch locator tool. You can find First Tennessee Bank, NA office/ branch locations and address, phone number and other contact information in a particular City, ZIP Code, County or State.